is a place where you can buy fresh locally produced food and craft-work. The range of food includes home-made cakes, jam, honey, marmalade, savouries, flowers, plants, seasonal fruit, vegetables, homemade sausages and locally farmed meat. New and traditional crafts includes items made in wood, hand-made greetings cards and knitwear. None of the food is pre-frozen so you can buy to put in your freezer. Everything is made under strict hygienic conditions (home kitchens are inspected) and the label will show the date when it was sold and the name of the person who made it. 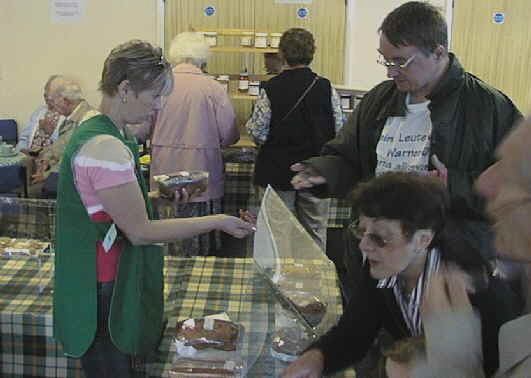 The Oxted Country Market is held every Thursday at the Oxted Red Cross Centre between 10.00 and 11.30am. Buy if you like or just meet over a cup of coffee. There’s nothing to join. There are also special events throughout the year. Home-made garden produce. Seasonal fruit, plants and flowers. A chance to meet people. Turn your talents into cash if you are a cook, baker, gardener, craft worker. Food parcels for the sick, elderly or for students. Celebration hampers. Parcels for yourself! Country Markets are true co-operatives where everyone is expected to help in running, setting up, selling and clearing away. They present an opportunity for everyone - both men and women aged 16 and over - to make money by selling to the public without the overheads of going into business on their own while still complying with trading regulations. The Country Market Parcel Scheme provides a unique service through the country. Arrangements can be made for a selection of fresh Market goods to be delivered to the recipients home. The scheme is useful at any time of the year, but especially at Christmas. Food, new and traditional crafts. Regular visitors to Country Market stalls are already familiar with the diversity, high quality and great value of our produce. Customers can be assured that Country Markets comply with trading regulations and all goods are sold at competitive prices. All our food is freshly prepared so it can be frozen. It also contains no added preservatives. Please visit our Market. Not only will you receive a warm welcome, you will be amazed at what you will find. You can even taste some things before you buy. Come along and see our 'Fresh Approach to Traditional Skills' - you won't be disappointed. We are very friendly! e home cooked food . P a r c e l s a r e a l so welcomed by students when they are miles away from home. If you are arranging a self-catering holiday we can take the catering part out by delivering a parcel when you arrive. Or why not arrange for a parcel to be sent to yourself to make life easier if you work? You do not have to be a member to use the scheme - just appreciate well-made home produced food. O x t e d C o u n tr y M a r k e t is a n o n- p r o fi t making organisation. The money taken goes back to the producer less a small commission for running expenses. The amount repaid on sales to producers is usually paid at the end of each month. It can be used in many ways, from helping with the weekly household bills to paying for driving lessons or holidays. Country Markets fulfill many needs. They encourage the production of first class produce and they help people with family commitments and home ties or pensioners and the retired, to earn extra income. The first WI Market was held in Lewes, Sussex in 1919 to provide a place where surplus home-made and home-grown produce could be sold To the general public. In 1932 the first Wl Market Co-operatives were registered at the request of The Ministry of Agriculture, Fisheries and Food. From 1972 to 1992 the turnover increased from £1m to £10m. 1985 saw the launch of the 'Happiness Hamper's' designed to provide produce to local homes for people with special needs. A big change happened in 1995 when Markets separated from National Federation of Women's Institutes and became self financing and 1997 saw the introduction of the present logo and our 'Fresh Approach to Traditional Skills'. We are now known as Country Markets Ltd.
Country Markets continue to have close links with similar organisations in Northern Ireland and Ireland together with other organisations such as Federation of Agricultural Co-operatives (UK), plus wide ranging statutory bodies in the UK and Europe. They are registered under the Industrial and Provident Societies Acts. ve, thus enabling prod ucer s to capit alise on their skills.